But recently I’ve had occasion to think about this “garden community” idea in a different way. Not just that gardeners form their own worldwide community, but also that a community enriches and celebrates itself through gardens. Here’s what happened. You may know (see Perennials story if you don’t) that I spend part of my time in a tiny town on a tiny peninsula on the extreme southwestern tip of Washington state. I was there recently (second half of March) and came across something truly amazing. 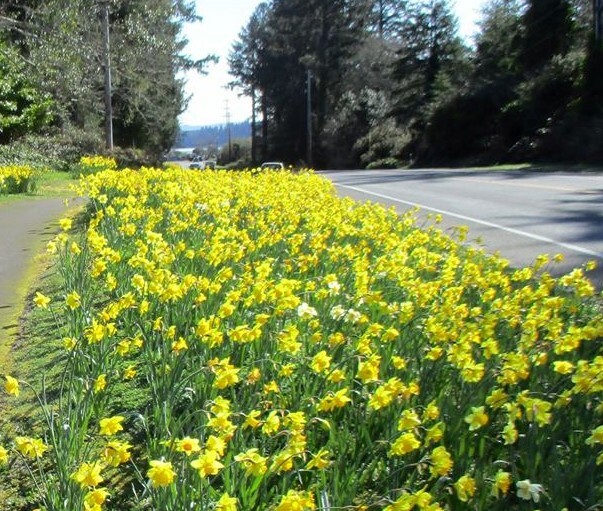 Along one of the main east-west streets that cut across the peninsula, from about the midpoint to the eastern edge – a distance of a little more than a mile – was an absolute river of daffodils in full bloom. 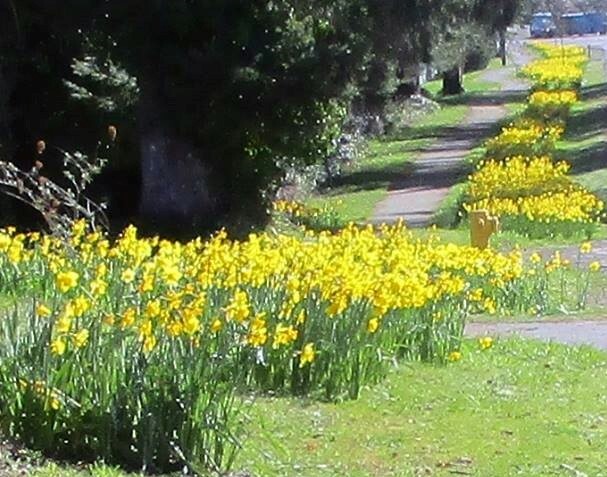 In October 2018, nearly two dozen hardy volunteers planted more than 8,000 bulbs, which were donated by a local business owner (whose General Store is a much-loved landmark in the area). And the result was simply stunning. I found myself going way out of my way to drive that road, so I could soak in the magic. Then I started thinking how this one simple idea, with such magnificent results, so richly embodies the spirit of “community.” A community business leader put up the funding, enthusiastic volunteers did some very hard digging and planting in unfriendly weather, and they all did it simply to make their little town more beautiful.